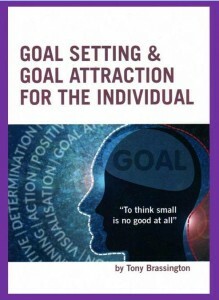 I have just published my first book, “Goal Setting and Goal Attraction for the Individual”. It has been a great deal of hard work and took much longer than I expected, but now that it is printed I can call myself an author. I am very pleased with my first completed written work. I love the subject of goal setting and attracting the success that a person chooses for themselves, so for me it has been a labour of love to write this book. This book is available in any good book shop or online book retailer. Goal setting – the book goes into detail about the different types of goals and why we need to set goals. A goal setting exercise is included to help you arrive at your true goals list. Goal attraction – After setting your goals you will then have to get to work on achieving your goals. I use my term of goal attraction. Understanding goal attraction is the key to you becoming excellent at setting goals and then reaching those goals – now isn’t that what we need to do? Reach your goals? Even today there are still so many people that have set goals and do not understand why they cannot achieve them; this can create for them all kinds of emotional pains like – disillusionment, anger, resentment and they ultimately become discouraged. Positivity – Is the number one lesson from personal development. Every course, training day, seminar or workshop on the subject of personal development or self help, every personal development or self help book or audio book will tell you that it is vital to have a positive mental attitude. The subject of being positive is a daily task, an ongoing life pursuit that can bring great rewards or if you fail and let negativity slowly gain a hold of you the cost will be very high indeed. Goal Setting and Goal Attraction for the Individual – is a book that can make a difference to you, it will help to bring about the result in life that you desire and aid you to being a full and complete person.